So... when I do get back to a spot with sufficient signal to dive back into that website rebuild I started a bit ago... I've found that google has upgraded its mapping system to allow me to put really precise maps on the site...really easily, with a lot of information built in. Sooooo... As I rebuild the "Our Campsite" section on the main site, rather than the directions I've been having to line out, there's a button already built in that a person will be able to click and input your current location and get directions right to the marker I place from where ever you're currently sitting. 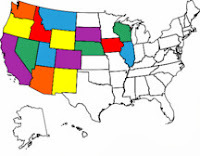 Also... rather than the way I've broke the list down now, dividing the states into arbitrary quarters, I'll build fresh maps for each state we travel through. That way, at the top of the page will be the state map with ALL the camps marked out for that state. I'll even be able to post on there the Overnight Stop locations we find, like the Walmarts, Casinos and simple widespots in the road... all a with just a simple and quick edit of an existing map! Suh-Wheet! All a person will have to do is pull up the state map and see where the markers are in relation to where they're at. Now... On to Bandon, Oregon. Hwy 101 north from Sixes is two lane that winds mostly through "canyon" of trees that lays a ways inland from the coast itself. There's no view but of the trees and occasionally across an open pasture to the low mountains on the east... and passes the concealed driveways of hidden houses and farms disappearing into the thick timber. The weather though sunny was cool, and bit with a chill that had me regretting the decision to leave my fleece in the rig when we left camp. Bandon sits on the coast just a sliver over twenty miles north of our camp on Edson Creek. Coos Bay is another thirty miles and a bit further north. The two ports date back to the late 1800's and in the 1990's they built what they call a "small boat basin" in Bandon. Look over in the corner there, behind the Prowler Charter boat and the Coast guard Boat and you'll see the red walls of the Wheelhouse restaurant. That's where we backed the Raider into the curb in front of it, found a seat by the windows to enjoy a nice lunner and kicked back. Hot Clam Chowder, with an excellent salad and a cup of hot black coffee with a view of the marina... As we sat down to eat, the fishermen off of the charter boat that I photographed later unloaded its catch of the day. A fine motorcycle on the PCH riding to Good Clam Chowder, watching fresh sea food hit the beach on a sunny day... a nice meal. For the wanderer hunting the bounty of the sea there's a selection of nice looking lil' spots all over town. Set about on the boardwalk are several large wooden sculptures. They look to me to have been carved from native timber and executed with a fine hand. We'd ridden all the way up to Coos Bay before stopping in Bandon on the way home. Heidi had seen and liked the look of this lil' town as we rolled through and suggested we come back here for the break. It's a nice relaxed looking little burg that has some shops and a nice feel to it. I especially like a place that has made the effort that shows in the small touches. When the trash cans and the ash trays are dressed up to add to the personality of a place and frame the flower boxes, it says a bit to me about the people of a place. Out at the mouth of the port area sits the Light house that the locals memorialized in their street lights when they juiced the place up in recent years. ... and here in Bandon the flowers find purchase in the bald rocks of the breakwater the boardwalk rises over on short stilts. While the sign posts give the direction... they don't say anything else. If you look in the windows above the flower box and trash can you'll see the directions given to the folks of Bandon... so... I guess if you live on the coast you live with one eye on the sea! :) and your running shoes handy! With a belly full of Clam Chowder and hot coffee the ride through the sunny early evening was warmer than the out-ride. Great sculptures to check out. I like your ideas about the camping spots. I'll be watching how it plays out. It certainly is hard to get the work done when there is so much fun to be had!! Ahhh...our FAVORITE coastal town! We'll be spending all of July/Aug as lighthouse hosts there. Looks like we're getting close to crossing paths? We're north of you at Nehalem Bay going south. We'll be in Florence by the last week of the month and then hitting Bandon. If you fancy a meet-up let me know. P.S. There is a nice, inexpensive ($10/night) campground at Tillamook just before the air museum. I think you'd like it.